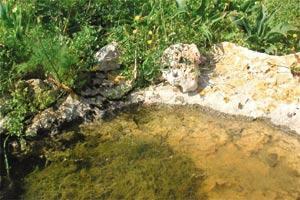 Temporary ponds, as found on the Ta` Cenc garigue, have been helped by recent rains following a dry winter. These are among the European categories which still have to be nominated within Natura 2000 sites in Malta. Are snails more important than people? The Austrian team leader for Europe's ecological network answered this question at a seminar on nature protection last week. "They are not more important than people but ultimately essential for people. We want to find ways to develop in which snails and humans can live side by side." This is the philosophy of Europe's ecological network. Identifying areas where nature is still alive and planning measures across all sectors to conserve it, is the basis of Natura 2000. Snails, along with geckos and, only in Gozo, a rare and endangered native shrew, can be found living in rubble walls. Disturbance, chemical runoff from farms and natural disasters are destroying this habitat. Despite such measures the web of nature is unravelling worldwide as plants, animals and their ecosystems are fighting for survival. At the current global rate of extinction, species are dying out at the rate of one every 20 minutes. A political decision was taken by European countries in 2001 to stop the decline in habitats and species. In 2004 it was decided on a European level to integrate nature protection into existing rural development and structural development programmes. This meant that the full cross-section of ministries would have to consider how to implement Natura 2000 across the board. On this small chain of Mediterranean islands, overrun by humans, a number of species are barely clinging to existence. Take cliff-dwelling species, which are designed to thrive in their remote home on the vertical cliff face. Their habitat might be considered harsh but they are well protected by their inaccessibility. Many of our important species are found living in less remote areas where an accumulation of trampling and other pressures threaten to put them on the extinct list. Different species of plants and animals interact with each other and with their physical environment or habitat to form an ecosystem. In Malta this can be anything from a small seasonal rock pool to a sweep of sand dunes. Malta's dense population and the impact of human activity on the countryside is putting many species, including some not found outside these islands, at risk. We do not yet recognise the importance of what is being lost. For the past year and a half a team of two Maltese and two Austrians have been working on how to strengthen Malta's capacity to implement the EU's Birds and Habitats directives. The Natura 2000 twinning agreement has helped define how Malta could contribute to the long-term survival of endemic species that will be part of Europe's natural heritage. This project addressing the obligations of the Birds and Habitats directives through the Natura 2000 network in Malta has been backed by EU funding of €360,000. These two directives are the main tools available in Europe to conserve biodiversity together with international instruments such as the Biodiversity Convention. MEPA relies entirely on EU funding for environmental projects, such as this twinning exercise, to strengthen Malta's institutional capacity to set up and run Natura 2000 sites. Opening a seminar to present the results of the project, Environment Protection Department head Martin Seychell said: "Nature is the foundation for our quality of life - our prosperity is underpinned by healthy ecosystems." Progress has been made on safeguarding species and habitats from invasion by genetically modified organisms with a number of measures in place. The Nature Protection unit has started work on a national biodiversity strategy and action plan which is expected to be in place by 2009. Some of these funds have gone towards work on Filfla and other marine protected areas. Attempts to improve the native lizard population on St Paul's Islands by captive breeding and a rat control programme are being funded by HSBC. Formal footpaths are planned to contain human impact. Mr Seychell stressed that we do not even fully understand the importance of what is being lost. He added that work on saving biodiversity should be cross-cutting and applied in all spheres. For example, in keeping with the Water Framework Directive, Malta is hoping to achieve good ecological status for water catchment areas and valley systems with the ecosystem approach in mind. However, as pointed out by resident twinning adviser Michael Reishcer, the Fisheries Department (Ministry for Rural Affairs and Environment) has just sent a report to the Commission with no reference to Natura 2000 - "it will be sent back". Some species are key to the health of an ecosystem as they play a vital role in the success of ecological communities. When pressures of pollution or development lead to their disappearance the whole ecosystem can collapse because the survival of other species depends on these keystone flora and fauna. One example is marine grass (Posidonia oceanica) on which entire fish populations depend. If the sea grass goes, the fish go with it. Losing a plant or an animal found only in Malta or Gozo, or on one of the smaller islands of the archipelago, is a loss for the whole world. The Maltese Islands are rich in biodiversity but, with such a high population density, human activity is having a great impact. Our islands have one of the highest rates of extinction in the world. On a global level, extinctions have accelerated to 27,000 species per year - that is an average of one species lost every 20 minutes. Co-project leader Thomas Ellmauer spoke of the huge variety of natural heritage including different landscapes and species ranging from northern to southern Europe. "The European Union has a community interest to protect this heritage and each member state will contribute to its protection. Malta has some species and landscapes which are unique in the EU." A wide range and variety of different species, biodiversity provides many services and opportunities to humans. While there are 75,000 plants, the world relies on only 20 of them for most food. In Germany half of all medicines are made from plants with curative properties. Cultural identity is strengthened by biodiversity which gives people a better sense of where they live and where they come from by identifying the plants and animals around their home. Do we have the right to exploit biodiversity without preserving it? Most people answered "No" to this question in a Eurobarometer survey. The network of Natura 2000 sites designated so far takes up one-fifth of the European landscape. Member states through their agencies which must designate the sites on the basis of criteria drawn up by EU. In Malta this process was started in 2000 and is ongoing. Removal of a qualifying site from a proposed list of candidates for the Natura 2000 network drawn up by the Nature Protection Department within MEPA raised more than eyebrows in Malta and Brussels last year. The powers and pressures that be did not reckon with Europe's dedication to meet biodiversity targets through its ecological network. The extent of the area at Ta' Cenc as a Natura 2000 site is still being discussed between Malta and the EU. The European Commission is determined to see that member states take the necessary steps to achieve this European objective. Appropriate assessment is a tool to make sure designated sites do not deteriorate. The need for Environment Impact Assessments in and around Natura 2000 sites cannot be waived. Recent proposals for amendments to Malta's EIA regulations do not show much support of this principle. For any sort of development or activity taking place within a Natura 2000 site it must be proved that no harm will be done, bearing in mind that even indirect disturbance (e.g., lighting, moving of rubble walls) is considered to have an impact on species. It is clear from the Habitats Directive that no hunting can take place in Natura 2000 sites during the rearing season or various stages of reproduction. "These requirements must be taken on board," stressed Mr Ellmauer. This year a report is due on the conservation status of our Natura 2000 sites. Malta is obliged to undertake monitoring and surveillance and report every six years on whether the status of the sites is favourable or unfavourable. If a site is found to be unfavourable, Malta has a duty to restore it. This can be done by reintroduction of species and better protection of the habitat or environment in which they live. Even where only one plant is left in an area where attempts can be made to restore the population with seeds or in vitro propagation. Restoration must take place under a biodiversity action plan, now in draft form and awaiting public consultation. The European Commission is responsible for the implementation of European law and directives in member states. Nature infringements see a high percentage in the number of cases brought to the European Court of Justice. There have been 37 so far. If there are problems over Natura 2000 sites in Malta we can be sure the Commission will start infringement procedures. Several Natura 2000 sites that need management are still not managed, and discussions with various categories of land users have not yet started. Speaking on the financing and managing of Natura 2000 sites, Wolfgang Suske said that communication with land users could be taken up as a funded management measure. In other European countries funding has helped both the removal of alien, invasive species and creating employment for the unemployed. Natura 2000 projects should not only do something for nature but also support the people living and working in the area. In conclusion, Mr Suske told participants, "you cannot just designate - you have to manage and restore the sites. The EU is focusing the budget and financial instruments on Natura 2000. You have to make pressure on the ministry to implement it." Maltese project leader Darrin Stevens said that MEPA had found a number of farmers interested in managing Natura 2000 sites who were ready to embrace nature in their daily work. Once farmers start to receive EU money for this then we are likely to see a chain reaction. Organic farming is the real key to nature protection in and around these sites. MEPA is surveying cliff and wetland species to prioritise future activities. Invasion of the sand dune habitat at Ramla Bay in Gozo must be held in check. Derogations must be regularly reported to the EU. If a permit for a certain activity is allowed on the basis of scientific study then the EU may ask to look at the data. EU funding is also available for a nature trail linking all Special Areas of Conservation in Malta and Gozo. Adequate compensatory measures still have to be hammered out. Speaking on management, Nadia Lanzon from the Nature Protection Unit explained that by 2013 Malta should be managing all Natura 2000 sites. MEPA is responsible for general management but site management can be carried out by non-governmental organisations (NGOs) or other stakeholders. Consent for activities within these sites is required by MEPA. So far five sites are managed or partly managed at Ghadira, Simar, Wied Ghollieq, Ghajn Tuffieha and Dwejra. The often vandalised wetland fenced in at Ballut ta' Marsaxlokk is still waiting for a management agreement. While some work has been done on the Marine Conservation Area between Rdum Majjesa and Ras ir-Raheb the management process has yet to start. MEPA is hoping to have a detailed management plan in place by 2008. Further consultation is needed where there are areas of conflict such as spearfishing and watersports. A management plan may not be needed for Filfla since prohibited access is a management measure in itself. Fishing is still allowed from moving vessels. Discussions over the management of Wied il-Mizieb are under way with landowners and the local council. Site managers and NGOs need to be trained further. Having one main co-ordinating committee would ensure consistency of site management. Mr Reischer, who was sad to be leaving Malta at the conclusion of this project, said that during the 18 months of the project 67 recommendations were drawn up on how Malta could implement the Habitats and Birds Directives in the short and long term. Workshops were held for different authorities and sectors such as farming, fisheries, tourism and hunting. He said that even though there was real interest in the Natura 2000 concept, co-operation still had to be improved on realising nature protection. There should be a continuous information process about the obligations arising out of both directives. "There is species richness here," concluded Mr Reischer. "It is worth proceeding with Natura 2000."